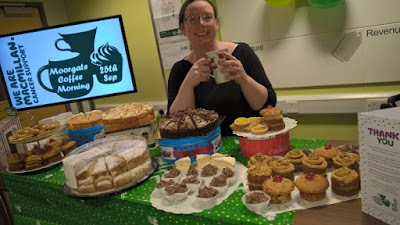 Businesses across the Rotherham borough have been hosting coffee mornings as part of the Macmillan charity's annual event. RiDO's Moorgate Crofts business centre saw a number of tenants join together to host a coffee morning. Inspired by the team at Human Recruitment, staff from insolvency practitioners Moorhead Savage, CRG Care home, AJ training and RiDO baked and sold coffee, raising £200. More than one in three of us will get cancer in our lifetime and it's the toughest fight most of us will ever face. Macmillan provide practical, medical and financial support and push for better cancer care. The World's Biggest Coffee Morning is Macmillan Cancer Support's annual flagship fundraiser and started in 1990, when a local fundraising committee decided to hold a coffee morning where people came along to meet and mingle - as they might ordinarily do - but donate the cost of their coffee to Macmillan in the process. The simple ask of getting together with family, friends or colleagues for coffee and cake and is celebrating its 25th birthday this year and is hoping to raise even more that the £25m raised last year to help Macmillan provide vital services to ensure no one faces cancer alone. Nicola Savage of Moorhead Savage (pictured), said: "We were overwhelmed by all the support we received on the day and are delighted that we managed to raise so much in such a short space of time. "It was a huge success with visitors, delivery men and people working at Moorgate Croft Business Centre and everybody was incredibly generous with their donations." Coffee mornings have also been taking place at AESSEAL, i-motion gym, Burrows Toyota, Holiday Inn Express and Dunelm.